I've really enjoyed painting with Verve! 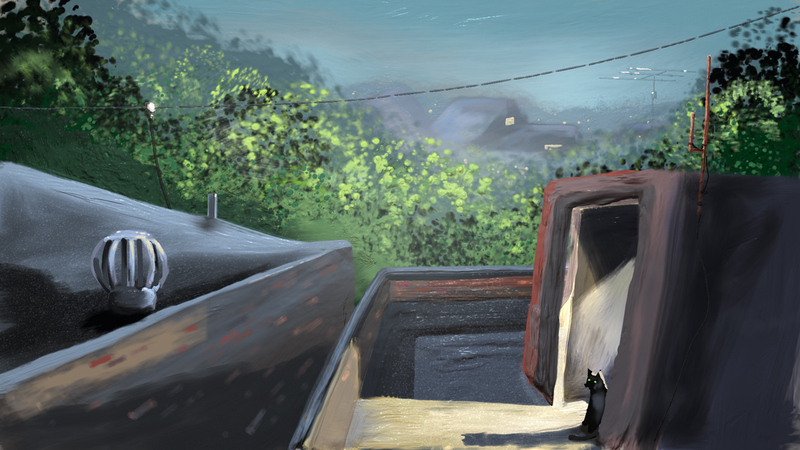 Here is my second piece called "Rooftop." It has an overcast evening feel to it. I only have a mouse to work with for now. Please visit my site: http://k4icy.com/ for my design work, 3D tutorials and all manner of ham radio bacchanalia! And bravo for the mouse work! I don't imagine that you will do with a pen tablet! Oh man, that's cool! The cat's sweet, haha! I like the sense of depth you have in there, too! Very nice feel! Thank you Taron, I'm flattered! Thanks Pilou! I have you to thank. Though, I will not promise tutorials - painting is so personal. On a technical note, I noticed that my PC's overall performance (other programs) was considerably slowed even when Verve was minimized. I imagine that there is some fluidity engine that keeps working even when minimized? I used too many layers, which is an bad habit borrowed from Photoshop use. Once I had too many, Verve did not let me access them, once off screen (no scroll,) but maybe I will try to 'merge' them. So is there a way to set the angle of the brush bias with the mouse? I love your trees technique! Also, might I suggest a future consideration to allow Verve the ability to import an image on it's own layer for layout and tracing purposes? I tend to prefer hand-sketching my concept layouts. You can actually still access the layers via the hotkeys [F9] - [F12]...check the docs in the Info&Download threads! Hmmmm....I gotta see, I could probably check for minimized window and then suspend the process. Didn't even think about that! This one is called "Desert Miracle." 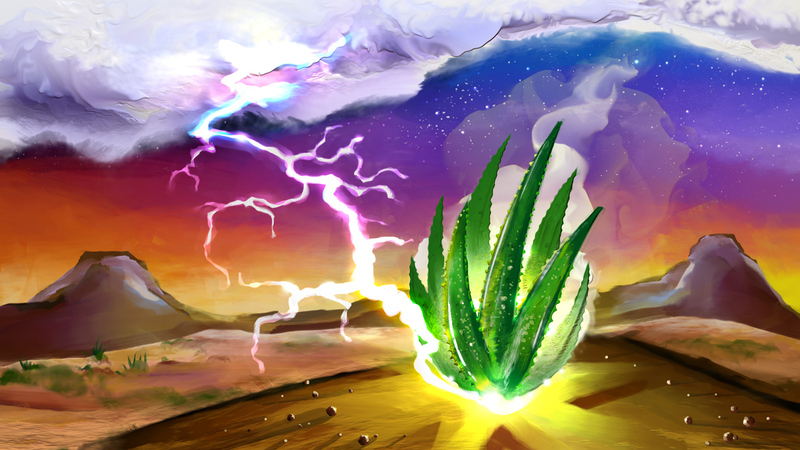 A remote Aloe plant imbued with mystical healing power from above. Totally wicked! ...in every way! But it works quite well! Love the little pebbles, haha! You should've some bigger more prominent ones to keep going with the great lighting/lightning! Awesome! The pebbles were last, and by then everything was lagging really slow, however to be fair I was also running a wide-format printer software RIP. ...oh, lots of layers - makes Verve cry, I have to stop making so many and just learn to trust my painting... to go with the flow. I called it quits when I tried to undo a layer merge - and it didn't work... But all good now! Ahhh, I'm digging for a good expression to describe how wonderful it is to hear that! I hope it's alright, if I say: Me, too! Now I gotta see that I continue with the interface...need to get some standards up like custom resolution input and all that.